The second wave of these have just been released last month in Japan, and even though I was vaguely aware of the first wave last year (thanks to Bladestorm talking about them to me in November), I didn't realise they were directly produced by TakaraTomy... I just figured they were licensed, or by Tomica (they have very similar styled boxes, and are mostly diecast like the Tomica vehicles). So these are called Metacolle figures, (the Katakana is Metakole - but the word Metacolle is short for "Metal Collection" figurines), starting out in 2015 with Marvel characters, and has since grown to cover several licensed brands like the Tomica vehicles had. The first wave of Transformers figures came out in September 2016, featuring TF4 Optimus and TF4 Bumblebee. The second wave that came out in March 2017, feature TF3 Optimus and TF3 Bumblebee. They are priced at about AU$10-12 each in Japan (1000yen), and places like HLJ still have them in stock... and have been found in toy stores in HK. They are in similar sized boxes to the Tomica vehicles, so the figurines are about 8cm tall (palm sized), and have three points of articulation (arms and waist). They are quite nice. Came back from a recent Japan trip with quite a number of these. 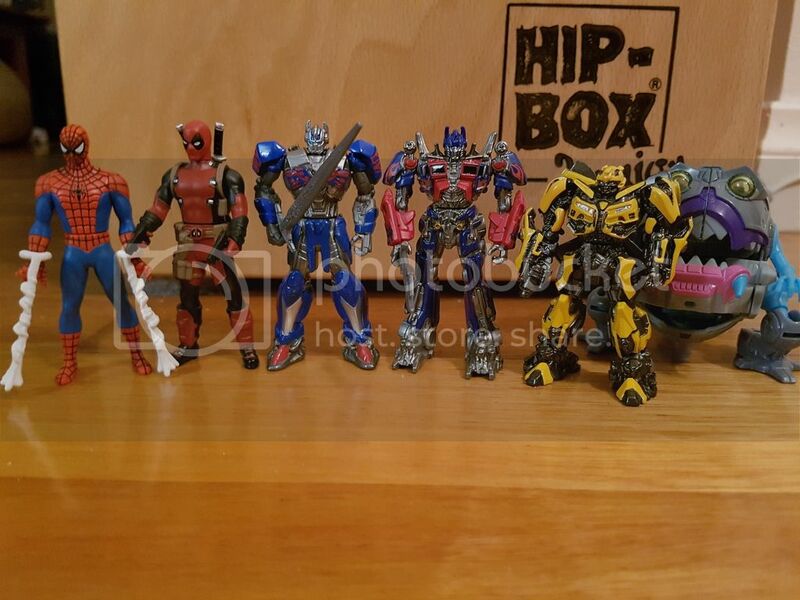 In addition to TF and Marvel, they also have Pixar, Pokemon and Evangellion amongst others. Here's a handful of the ones I picked up. Sharkticon is photobombing for scale.